I've mentioned before how I thought Mr. 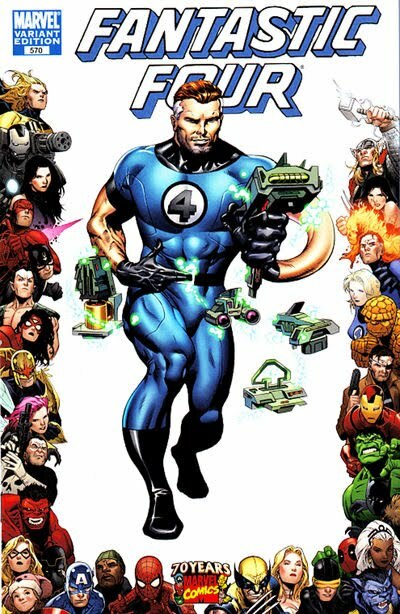 Fantastic's character was assassinated under the hands of Mark Millar (and, to a lesser extent, Brian Bendis) but I never really thought about how exactly. The character clearly wasn't acting as I thought he should act; he seemed more soulless than he should. But I never really analyzed how and why. But I was mulling over Jonathan Hickman's first Fantastic Four story and realized that he hit the nail on the head right out of the gate. The problem was that Reed had been written with far too much hubris. Hickman never says that explicitly, but the notion that Reed would seriously consider trying to "solve everything" is the ultimate expression of ego. But that's really the antithesis of who Reed is; he was always a fount of humility. See, Mr. Fantastic is easily one of the most brilliant scientists on Marvel's version of Earth. And he knows that. But he also knows that he doesn't know everything. He repeatedly would call in and work with other scientists, happily collaborating on whatever the scientific dilemma du jour was. And when the other scientist would balk and say something like, "But, Dr. Richards, you're the smartest man on the planet; how could I possibly help you?" Reed would come back with, "Well, you've done more work in (insert scientific field) than I have and I could use your expertise." He was always an open scientist, calling in Hank Pym or Tony Stark or Hank McCoy or whomever had a specialty that he was perhaps not as experienced with. He recognized that others could and did provide valuable contributions to his (and everybody else's) work. But, even if you ignored that aspect of his character, he is a scientist and follows the scientific method. What that means is that, unless he tested the intelligence level of each and every individual on the planet, there is no way that anyone could prove he was definitively the smartest person. He could say that he was smarter than any single individual that he might know and be able to test, but he couldn't say he was more intelligent than EVERYBODY. Which is what inherently comes with the "solve everything" mindset. And while Millar and Bendis (as far as I know) didn't actually use the phrase "solve everything" themselves, it was evident in their writing of the character that he was attempting to solve everyone's problems. That he knew better than them by virtue of his intelligence and therefore his social policies were inherently correct. Reed, however, is not that man. In fact, he's made it a repeated and explicit point of not being that man. So much so that he willingly looks in the face of his self-confessed greatest failure every day of his life. 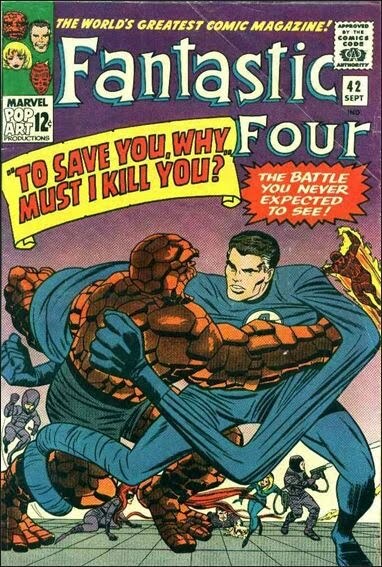 He takes the blame for changing Ben Grimm into the Thing and he is a constant reminder that A) Reed is human and makes mistakes and B) some mistakes cannot be corrected. Seeing Ben every day helps to keep Reed humble. He screwed up the life of his best friend and that is baggage he willingly carries around. Let me repeat this: Reed willingly looks in the face of his self-confessed greatest failure every day of his life. That is not the type of man who would take it upon himself to fix all the wrongs of the world to his liking. This is a man who devotes his life to making things decent and, if possible, enjoyable for his family: Sue, Johnny, Franklin, Val and, yes, Ben. Sure, Reed wants to know as much as he can and studies a great deal, sometimes to the exclusion of interacting with others. But he does that for the sake of knowledge itself, for furthering his own understanding of the world, not so he can make it better. What he knows often DOES make the world a better place, but that's a consequence of his work, not the point of it. And because his work is often dangerous and because he's irreparably harmed his best friend from one of his mistakes, he's not going to gamble the lives of the entire planet over whatever social theories he might hold. He's much more humble than that because he's not the type of person to sacrifice others for his own ideas. Is Reed the smartest man in Marvel's Earth? Probably. Does he know that? Yes. Does he feel that entitles him to anything? No. Great point, I think you hit on something there with how Reed has been portrayed. I absolutely hated Mark Millar's run, to the point where I used to read his stuff and now can't - because I feel he ruined my favorite comic. I've been much happier with Hickman coming on board, and I hope he continues to make things interesting.